New Liberty model and Liberator refurbishment sweeper seek to respond to contractors needs. New Liberty and Liberator product lines are the latest in the planned product expansion by Mark Schwarze's Victory Sweepers, Inc. 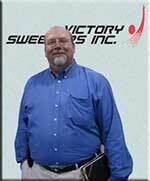 In this interview with Mark Schwarze, the president of Victory Sweepers, Inc., Schwarze talks about his decision to bring out the latest in the Victory line, the Liberty and Liberator models. To begin with, here's the press release the company provided about the new Liberator model. That is followed by an approximately 20-minute audio interview held with Mark Schwarze, where he discusses the new additions to the Victory line, as well as his company's commitment to charitable causes and some of the reasons why NAPSA membership makes sense. A diesel chassis attached to a high performance, 4.35 cubic yard, high dump, 61-horse power, turbo-charged, diesel-fueled sweeper designed for light construction and heavy duty parking lot usage. The Liberty DX includes the patent-pending, two-piece traditional hood and "Hoods-Up" system that easily lifts the leading edge of the sweeping head to allow access for light debris such as paper cups, styrofoam, etc. The Liberty model also includes Victory's large two-piece, removable separator screens, synchronized dump and screen access doors, and an extremely heavy duty aluminum control pane; all as standard equipment on a Liberty DX. Our huge 30-inch fan provides unequalled performance. In addition to our standard features, the DX also is available with the new exclusive (optional) aluminum toolbox that will make you say WOW! Our gigantic (optional) aluminum toolboxes definitely take you to the next level in huge convenient storage. A light weight; Commercial Grade means we've put "meat" where it matters and muscle where it's needed. You won't be disappointed. Expensive; it provides extreme value, NOW, when you need it. Complicated; our designation of "Fleet Ready" means we've designed all functions to make driver transition as simple as driver transition can ever BE. A reason to have to stock extra parts; rather, the Liberty has been designed to use most of the off-the-shelf parts already standardly used on most fleets, no matter which brand you currently own. The Liberty DX is... Commercial Grade... Fleet Ready... And, at a price that will make your banker, wife and customers smile! Don't let the price fool you: The new Liberty DX has the quality and performance you need, wrapped nicely in thick layer of simplicity. Although currently available in diesel/diesel only, we will soon be introducing the Liberty GX (gas/gas) and Liberty SX (single-engine in either diesel or gas) configurations. Check it out on the Victory Sweepers website or call today to arrange a free VALIDATION demonstration on your route. "As many long-time contractors know, the Schwarze family has an enduring commitment to producing what contractors tell us they need," says Mark Schwarze. "The new Liberty and Liberator models are a direct outgrowth of that philosophy. Although the response to our Mark I and Mark II models has been very gratifying, those models depart significantly from the parking lot market leader's sweepers. "Some contractors would prefer having the old-style controls rather than a joystick, for example, to better fit within their existing fleet. They also want more of a fleet-grade sweeper with great performance and without some of the extras our other models offer... if they can keep performance at a significantly lower price. That describes the new Liberty line. "The Liberator is an outgrowth of the many 340-series parking lot sweepers we've taken in trade on new Mark I and Mark II units. As we refurbished these for resale, we came to the conclusion it made much more sense to include some of the many newer design and performance features our Mark I and Mark II models have. The newly designed Liberator is a refurbishment package that fits on 2000 or newer 347 and 348 chassis. It provides the contractor who has a decent chassis with the option of getting what is essentially a fresh-looking sweeper for as little as $10,000. The response so far has been positive. "Victory Sweepers is actively seeking Value Adding Resellers for the new Liberty product line and Sweeper Parts Xpress's new line of Sweeper Refurbishment Products including the Liberator product line. If someone wants more information, they can give one of our Victory representatives a call for details (866-507-9337)." For the inside information on the new line, as well as a discussion of why he brought it out, Victory's charitable emphasis, and a plug for NAPSA membership, we invite you to listen to the following 20-minute audio interview with Mark Schwarze held by WorldSweeper.com's editor, Ranger Kidwell-Ross. Note: If you hear the interviews at 'chipmunk speed,' you will need to download the latest version of Adobe's free Flash player. No files will download to your computer.